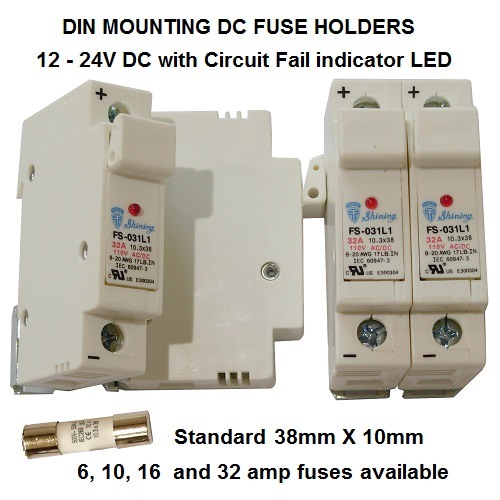 High grade 'UL' listed, DIN rail mounting cartridge fuse holders. Finger safe and fitted with a red led 'circuit fail' indicator as standard. Suitable for 12v and 24v DC applications. Choose 6, 10, and 16 amp fuse. Use regular 38mm X 10mm cartridge fuses. Faults: Units will only display a red indicator when the fitted cartridge fuse has failed. If the fuse is removed, the fault is cleared. Circuit must be connected and live for the indicator LED to illuminate and show fault condition. Note:You may wish to seek advice when considering fuse ratings for your intended DC circuitry. Always consult a qualified electrician if you are unsure.